Thanks Ian for the heads up on this cool little media player called Songbird. I’ve only tried it a couple of times, but it seems to work pretty damn well. You download the software and install the media player. 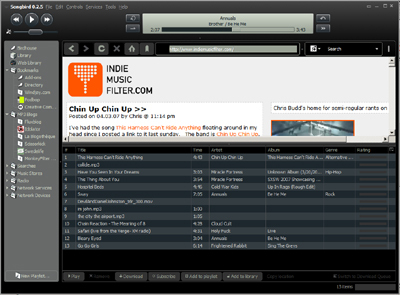 Then, you can enter the URLs of your favourite mp3 blogs in the header. Songbird searches the front page for all the mp3s links, then organizes them by newest to oldest. Then you can download them straight from the player. The downside of this? It just became a lot easier to find music on blogs without reading any of the insight/stories.